SMS tracker allows you to spy on text on Android phones. It’s hidden, free to download and easy to install. Spying on text has never been so easy. 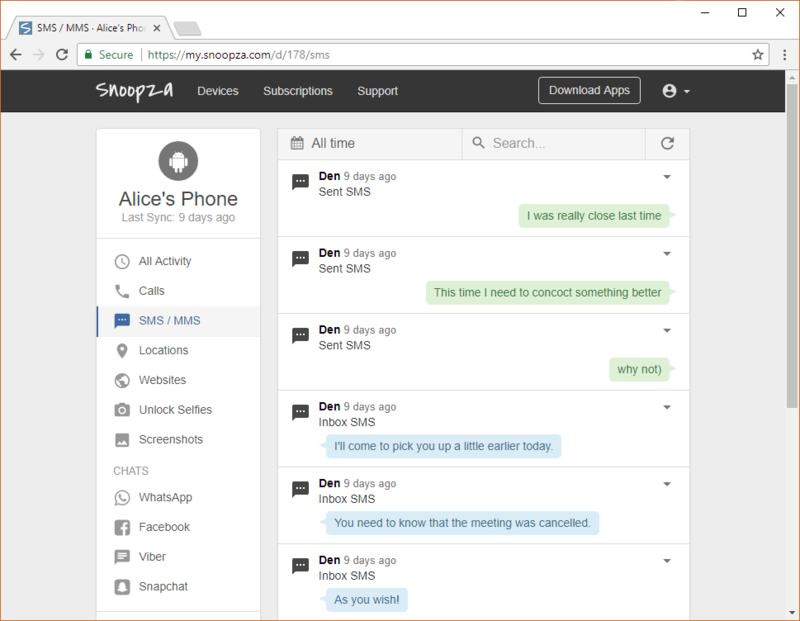 This software is a solution for those who want to track, read, spy on or basically look at someone’s text messages for free from another phone. Is it possible to spy on text or SMS for free? SMS tracking is a feature that is not included in the default setup of any OS – Windows, Android, MacOS and so on. To have such a function, you have to install an application. You can find many similar offers, but be careful, as a lot of scams are on the market. Yes, features can be free, but you must use your brain to find the best option. Don’t waste your time; choose Snoopza. Today, people use mobile phones for nearly everything and everywhere. Even children grow up with mobile devices in their hands. Of course, parents have to spy on text messages from another phone to know what is going on with their kids. Every mother, as well as every father, wonders how to view and read someone’s text messages. Nowadays, cell phones are an integral part of workplaces. A lot of employees work not in offices but at home. They use corporate phones or tablets. That’s why nearly every boss wants to know how to control workers for free. The free spy app Snoopza can be a solution for such a task. Snoopza is more than a modern SMS tracker (text spy); it’s a complex solution and powerful Android phone tracker. This free app allows you to monitor all received or sent information, MMS and other image messages, including WhatsApp and Viber. You can even spy on Facebook. For example, it is used for tracking text messages, monitoring locations, recording calls, and checking browser and SMS histories. If you decide to look at someone’s texts, choose Snoopza. This tool will give you a calm life. Try it! Do you know that the text message reader spy Snoopza is not just a useful but also very simple solution? You will know how to use it after five minutes. This fact is represented in the app’s popularity among thousands of users around the world. You can join them. Following are three main reasons to use it. Some married people (husbands and wives) may start writing online messages to other men or women. Who wants to be cheated on? Many people think that the Internet has a lot of advantages. However, it can be dangerous for kids. There are many incidents of cyber-bullying. Of course, parents want to protect their teens in this digital age. Businessmen do not wish to waste money on an employee who spends all his/her working time chatting with relatives or friends, watching films, visiting websites or playing online games. How can you access someone’s text messages? Easy. Use Snoopza. It’s one of the most useful software programs to answer such a question. Thousands of people have already chosen this SMS tracker, and you can join it today. If you’re worried about why your loved one (wife, husband, girlfriend) is typing so much on the phone, don’t waste time and ask him or her. Simple conversation can be a solution, but software can also be helpful. Frequent texting on any smartphone can influence the education of any child. When parents decide to install Snoopza, they get information about visited websites and sent emails, photos, SMS and so on. Thanks to this free message tracker, you can see whether your kids are looking at something forbidden. And, of course, you’ll know secrets about their relationships with their friends. A boss can’t check on his staff by standing over them. If you think that your workers aren’t completing their responsibilities, that they’re wasting working time on useless things, this app will reveal such problems. This free SMS tracker can make your company more successful. Can other spy messages increase your productivity? We aren’t sure. As you know, getting cell phone text message records is easy, so don’t hesitate; try it for free right now. getting a picture at moments when someone unlocks his/her device. It should be mentioned that this phone text spy sends a notification when a user starts changing his/her SIM card and also allows you to see the SIM card location. There is one more important function. Many other spy apps for text messaging don’t have it. Snoopza remains invisible as long as you need it to. That’s why the user won’t know about this messenger spy. Use this Android application to read text messages on another phone/tablet without fear. It works like a real spy and can remain your secret as long as you need it to. Tracking is available in your own online account. You have access to it 24/7 from anywhere with an Internet connection. If you don’t want to waste time and money, want to ease your mind, or want access to information, download the free SMS tracker. This text spy is available to everyone. SMS Tracker by Snoopza is a hidden app for spying on text messages and saving call histories, contacts, locations, cameras, audio, internet activity, Instagram, WhatsApp, Viber, Facebook, Skype and Telegram.